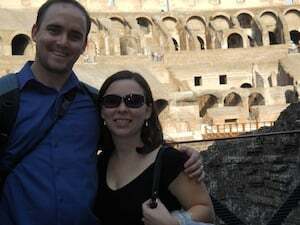 Like many people who would register with a website like Traveler’s Joy, my husband and I have a true zest for travel. We love experiencing new cultures, unexpected moments, and the thrill of doing something once in a lifetime. Our honeymoon was just that. During the planning stages, we had various different locations we seriously considered but ultimately we ended up going with a European food, wine, and adventure tour. Granted not the least expensive trip we could have chosen. We spent around $5,000 with plane tickets totaling around $850 each for direct coach flights. About half of our budget came from generous gifts from our friends and family through Traveler’s Joy, which really made the whole trip possible! With the allure of all of the luxury Western Europe has to offer, it would have been very easy to spend much more. We did a lot of pre-planning and shopping around to find good deals on hotels, budgeted to stay at fair accommodations, and spend more on eating and activities. The 10 pounds I shed to fit into the wedding dress seemed to easily throw themselves back on and were a pretty good indicator that we succeeded in the food department (Just for the record – totally worth it!). We flew to Europe midway through September for more temperate weather, less tourists, and to find wine season at its peak. We chose to begin our trip in Paris. It’s centrally located in Europe so we could do some additional traveling around which we did by high speed train, ridiculously slow speed train, bus, boat rental car, subway, carousel, and quite a bit on foot. We spent 16 days traveling from Paris to London, Rome, Tuscany, and then back to Paris to fly out. Needless to say this isn’t the typical "laying on a beach" kind of honeymoon most people go for. But for adventure-seekers like us, this was the perfect way to go! After a long and cramped flight, Paris was a wonderful city to welcome us to Europe. We decided to stay in Montmartre at the Hotel de Paris (original, I know). When they call Paris the city of love they must have been sitting in a café in Montmartre watching couples leisurely passing by carrying armfuls of fresh bread and cheeses from the local market. Walking around the streets of Montmartre, we passed by a slew of art markets with beautiful handmade scarves and paintings leading to the Sacre-Coeur. 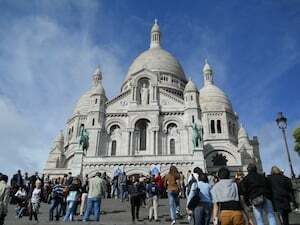 The Sacre-Coeur (Sacred Heart) is an iconic church perched on the top of a hill. From the foot of the church, we were able to see an aerial view of the city as a prequel of what Paris has to offer. The inside of the church is a sensory experience – the warmth of candles lit at various prayer areas, the sight of ornate bronze statues among neo-Baroque architecture from floor to ceiling, and the captivating sounds of their choir and massive organ left us feeling awe-inspired. From there we had our first of many foodie experiences in Europe with café au lait (coffee with milk), goat cheese crepes, and crème brulee. We have both decided a trip to Paris without all of these foods would be a travesty. The crème brulee was amazing and rivaled as the best dessert with the tiramisu in Rome. After a 20-minute debate discussing the merits of both of these desserts, we came to the realization that they are both impossibly delicious. The rest of the day was spent at the Eiffel Tower, which for my husband (who is a photographer) seemed like a dreamlike location. It is unquestionably architecturally fantastic and serves not only as a symbol of the city but also a symbol of the love of travel for many (including us). We woke early the next morning to take a high-speed train to London, a short two-hour jaunt under the English Channel and we were there. 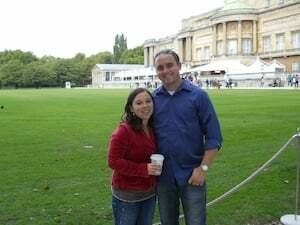 My husband and I have been considering moving abroad for several years and after hearing me sing London’s praises since my last trip in 2008, he was anxious to experience the city. I could tell shortly into our trip that we were both falling in love with the idea of moving there. London has an energy to it that has the excitement of New York City with the approachableness of a small, quaint town. The city is easy to navigate, has a huge variety of different cultures, and something to do for everyone. It is also architecturally beautiful at every turn. We spent the greater part of our week there taking in the beauty of the city with a good cup of tea in our hand. We found a lovely hotel located near Buckingham Palace (Grange Rochester Hotel in Victoria). The room had a marble bathtub, wrought iron balcony looking over a park, and easily the most comfortable bed in Europe. Aaahh -- the good life! By the way, here’s a quick note to address London’s reputation for awful food. We found great restaurants all over the city filled with the fried fish and chips they’re so famous for, but also with some real culinary treats (not to mention the beer!). Our favorite meal was at Dogget’s Coat and Badge near the Blackfriar Bridge. The lamb shank, salmon on puff pastry, and deep fried brie were to die for! We had so many memorable experiences in London, but there were a couple that surpass the rest. Surely, a palace will top my list! The tour of the staterooms in Buckingham Palace was truly lovely. What better way to feel fancy on your honeymoon than to feel like a royal for a day? Taking in the beauty of the royal family’s personal collection of paintings, antiques, and Faberge, we walked through the palace feeling cultured and sophisticated. They’ve recently put in an exhibit dedicated to William and Kate’s wedding with her wedding dress on display. This is an easy hit for the recent bride. My lovely husband kindly waited as I became temporarily glued to the display of her dress. Let’s face it we all love our dress, but her dress is just naturally jaw-dropping. Then, tea and desserts follow the tour in the royal garden. We chose William’s groom’s cake, which was a decadent chocolate biscuit cake (an easy choice against Kate’s fruit cake!). Following our scrumptious dessert, we spent time sitting under a willow tree observing their beautifully manicured garden. As we watched a duck slowly meandering his way along the water of a nearby pond, we found a true refuge from London’s bustling urban pace. We can’t speak of our trip to London without bringing up the theater. The Phantom of the Opera at Her Majesty’s Theater is an experience to remember. The ornate interior is remarkable with its gold splashed walls and ceilings and ornate fixtures on all sides. It is also a very intimate theater with even the worst seats leaving you with the feeling that the actors are right in front of you. When they sang into the crowd with their enchanting voices, we found ourselves completely enveloped in their performance. So much so that when the chandelier fell from the ceiling, despite us knowing it was part of the show, we jumped back in fear of being hit by flying crystal. Their tradition of serving ice cream during intermission was just another perk. 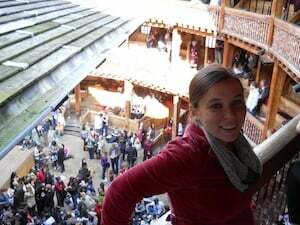 Shakespeare’s Globe was an entirely different experience but equally amazing. The Globe was modeled after an open-air theater from Shakespearean times. The wooden bench seating, stage trap doors, and total lack of modernization transports you to another time when you are taken aback by the quality of the actors’ performances rather than the special effects. After a full week of exploring we flew from London to Rome. We arrived on the first Sunday of the month which by a happy accident was free Rome day, meaning all of the major attractions like the Vatican Museum and Coliseum were all free. The Vatican Museums are overwhelmingly huge but equally amazing. We easily could have spent days exploring all that the museum had to show. The bottom half of the museum has a myriad of ancient statues that date back thousands of years leading to the top floors with massive works from Michelangelo, Raphael, and da Vinci just to name a few. Raphael’s rooms painted for the Pope’s private apartment are massive rooms with intricate paintings depicting different religious stories each one more breath taking than the next. Raphael’s rooms lead into the Sistine Chapel which I have to say is worth every bit of its reputation. The Italian guards demand silence in the mammoth room to allow visitors to spend time trying to take in the paintings filling every inch of the walls and ceilings. It was filled with the type of intricacy one could easily spend a lifetime studying. Few things could ever really top the Sistine Chapel, but I have to say the pasta we had afterward nearby in Vatican City did its best. As our meal progressed from prosciutto and mozzarella to pasta with seafood to the Tiramisu that we will literally crave until the day that we die, we looked into each other’s eyes asking how it is we got to be so lucky that we got to experience all of this. That evening as we wandered through the Coliseum and around ancient Roman ruins with romantic streetlights illuminating our way, we felt equally lucky and even more in love. We ventured from Rome through the countryside of Tuscany, first stopping at a beach along a mountainside and then to Chianti (wine country). We had originally planned to spend one night at the beach, but really, who spends one night at a beach in Tuscany? After arriving at our hotel and taking a short walk on the beach, I quickly rearranged our trip to stay at the beach for two extra nights. We stayed at Hotel Nautilus in Forte Dei Marmi during the offseason, which was glorious with the prices being nearly halved, the weather being perfectly temperate, and the fact that no one was there. It felt like our own private Italian escape. We spent most of our time in Forte Dei Marmi driving around the marble-topped mountains, laying on the beach, and eating every bit of seafood we could find. Side note: Their shrimp is nearly the size of our lobster! As seafood lovers, I think we are living in the wrong country. We left behind the beach to explore wine country. Chianti’s rolling hills speckled with castles and medieval towns were enchanting and incredibly picturesque. We visited Panzano, a small village in Chianti, which led us to one of the best nights of our life. It began with some wine shopping. We visited a shop to purchase bottles of Chianti which we intended to age for our 10th and 20th anniversaries. When the lovely couple that owned the shop found out we were on our honeymoon, we were given tastings of practically every wine in the store. Every last one of them was amazing! Filled with wine and good conversation, we searched for the reason that brought us to Panzano, meat. We had read that Panzano had the best meat in Italy, and in this case the guidebooks were absolutely correct. As we sat at a restaurant having the best meat platter we’ve ever had, we met some friendly Canadian sous chefs that offered us reservations at a restaurant that is a mecca for foodies from all around the world. The meal at Solociccia, the restaurant of world-renowned butcher Dario Cecchini, included eight courses of impeccably prepared beef that was boiled, broiled, and served as a tartar, each one more tantalizing than the next. The meal was capped with grappa (a strong liquor made from leftovers from the wine making process) served at the butcher’s shop across the street by the chefs of the day. The whole night felt magical and really was a foodie paradise. After a few more days of exploring and wine tasting, we flew back to Paris and enjoyed one more night in Europe. We spent our last day exploring the depths of Louvre, which incidentally was free as it was now free Paris day (also a happy accident). The Louvre with its seemingly endless string of rooms of infamous artwork was amazing and honestly somewhere we had a week to explore. We spent hours exploring the Egyptian exhibits and Napoleon’s rooms filled with colorful fabrics and treasures on every surface. We finished our night in Paris and our amazing trip to Europe by a good bottle of Bordeaux and walking hand in hand among streets lined with romantic architecture as we recounted our trip, our wedding, and shared excitement over our future together. We returned to the U.S. happily exhausted with the knowledge that we had a once-in-a-lifetime experience and the adventure of a lifetime. We both want to give a special thank you to Traveler’s Joy for making our dream honeymoon a reality!